Heifers are the future of your business, don't neglect their needs! 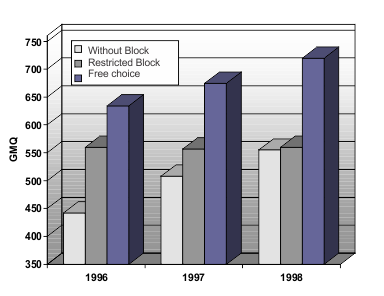 The Sup-R-Block is a food supplement designed for the optimal development of pasturing heifers. It prevents nutritional shortfalls caused by variations in the quality or quantity of available feed. Available with Bovatec. This Sup-R-Block meets the vitamin and mineral needs of dairy heifers.Contributes to excellent size development. Why make this investment for your heifers? Contributes to excellent size development. Limits competition between breeding heifers in the same group. Complementary nutrition as a function of varying feeds over summer. Complete proteins and amino acids - from calving to 24 months. Rain, snow, sun and heat resistant! Ensure that the animals got an adequate ratio of vitamins, minerals and salt before introducing the block. Place the blocks near a gathering place and/or water source. 1 block of 225 kg / 25 head. 1 block of 25 kg / 3-4 head. Don't let your animals be without the Sup-R-Block over the season. 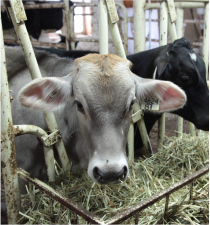 If consumption varies, check the quality and quantity of feed available. 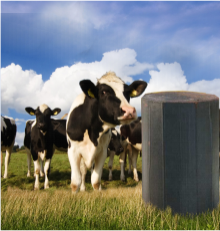 It helps maintain milk production and components for grazing cows; it meets their needs and your quota. The Purenergy A+ Sup-R-Block is a concentrated source of energy in the form of non-fibrous carbohydrates (starch), which is well-known for stimulating milk protein. The Sup-R-Block is also full of non-degradable proteins (urea-free) and has the perfect balance of amino acids to complement pasturing and high quality young feed. The Sup-R-Block is complete in vitamins and minerals that are essential to healthy milk production, proper health and good reproduction. Rich in potassium and magnesium to help fight heat stress and to correct shortfalls in magnesium from pasturing. Maintains consumption and flesh condition, especially during hot periods. Contains amino acids that metabolize when pasturing does not provide enough. The Purenergy A+ Sup-R-Block contains 14% raw protein (urea-free) and 65% non-degradable protein. The HO Milking Block is a concentrated source of protein (21% raw protein) and energy to help maintain milk production and flesh condition of pasturing cows. It contains urea and is an excellent complement to more mature pastures. The Sup-R-Block is complete in vitamins and minerals that are essential to healthy milk production, proper health and good reproduction. Energy in the form of non-fibrous carbohydrates (starch) and fat is ideal for maintaining consumption and providing energy during periods of heat stress. Provides a necessary third meal for pasturing cows.